As competition in the hospitality industry intensifies, hotel brands are looking for every competitive advantage to differentiate themselves from the competition. Industry disruptors like Airbnb offer an alternative to the traditional hotel experience by providing unique, personalized experiences. Major hotel brands are on the other end of that spectrum; a personalized experience is much more difficult to provide given the sheer scale of their operations. How can the large hotel brands create a more personalized hotel experience with digital signage to compete in the digital age today? It’s already been a long morning of travel and you finally arrive at your hotel. You enter the hotel lobby and there is a line at the check-in counter. Bummer. As you’re walking toward the line, you notice a screen nearby that explains the hotel’s new digital check-in process. Great! You pull out your smartphone and see that you already have a personalized message from the hotel rewards app welcoming you to the property and offering you the option to check in with your phone. Even better, you can use your smartphone as the key to your room. Step off the elevator on the seventh floor and there is a colorful screen with “704” and an arrow pointing you to make a left turn. Four doors down the hallway and you find your room, unlock the door with your phone and enter. You set your bag down and notice the small wall screen in the entryway is showing the golf course you played during your last trip. There, in the corner of the screen, is a tee time with your name next to it with the option to schedule it. Unfortunately, there’s no time for golf on this business trip, but what are the options for a nice business dinner? A few swipes and taps later, you have a reservation for three at the hotel’s steakhouse later that evening. Now it’s off to a full afternoon of meetings. This is not a sci-fi, futuristic hotel scenario. The technology needed to create this streamlined and personalized hotel experience is being implemented throughout the hospitality industry right now. The most innovative hotel brands in the world are using the powerful combination of interactive screens, customer data and striking creativity to take their hotels into the digital age. 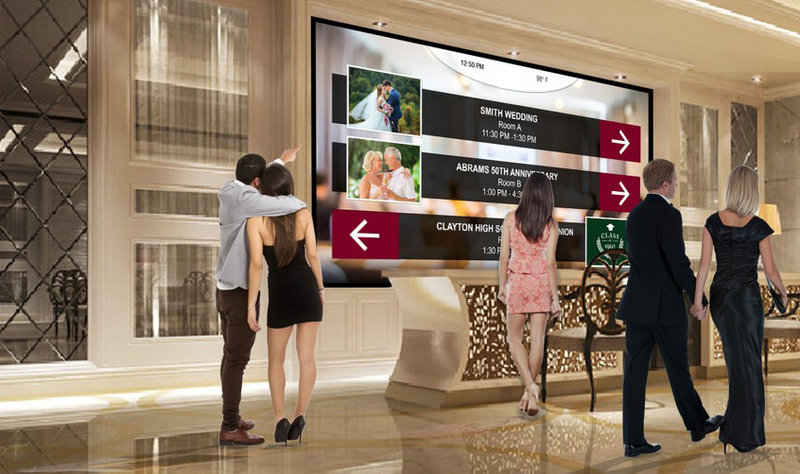 From the lobby to the hotel room and all points in between, digital displays are helping hotel operators sell-in additional services, improve hotel efficiency and elevate the guest experience. Customer data is being tied to beacon-based technology to show clients dynamically generated, personalized content at every touchpoint. Digital kiosks also help guests plan their stay and educate them about the amenities available at the hotel. Lobby installations create impactful and lasting brand impressions that simply WOW guests when they enter the hotel. These experiences all add up to stronger brand affinity and an improved bottom line. Implementing a hotel digital signage solution of this caliber requires a unique combination of hardware, content management software, and creative content. With over 30 years of experience in the digital signage industry, RMG provides intelligent visual communications to the most innovative companies in the world. See how our digital solutions go beyond the screen.